On March, 26th at Turfway Park. I caught the first glimpse of a horse with moves. I have seen many runners who were great, but only some have had that burst. The extra special thing you can’t train. Flat out… Animal Kingdom has some special mojo. That was his coming out party, and ever since then it has been tall cotton. The Derby was flawless with a cavalry charge, and the Preakness caught him napping as he watched the moves of Dialed In. He was sold for a bargain $100,000 dollars at the Keeneland sales. 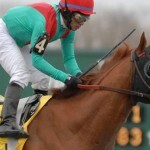 If he wins, how much talk will there be about the Preakness, and coming up a half short ? He is the son of Leroidesanimaux (King of the Animals). His background says run all day. He did well on dirt, poly, and turf. 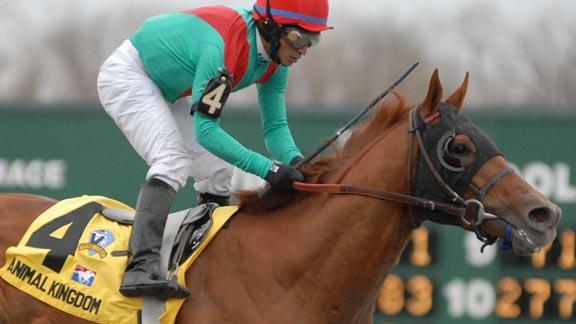 His trainer Graham Motion and Team Valor have decided on a turf career. You can’t squabble about this guy. He has run well on everything. If Motion told me he would excel on the turf. I would start scouring the condition book. He will be the blunt of my exotic tickets. I will part-wheel him in some tickets, and Master of Hounds will be my second to the Animal. He looks good in fits, but has not captured my eye like Animal. John Velasquez is in the saddle, and he makes few mistakes. Graham Motion is showing the world what a few have known all the while cashing tickets. It is rare to see three professionals all come together at the right time. That time will around 6:35 pm. this Saturday.